We take your preferred program and integrate it into the FitLyfe 360 Platform. This ensures that you are getting what fits your population. Better insights lead to better choices. Once an employer has the proper insight about improvements needed, they can then make a choice about keeping the current program or changing it without the worry of losing any historical data. FitLyfe 360 gives you unlimited choice. Allowing employers to bring in and change out program vendors is key since their population is ever changing and not every program works for every company’s employees. When insights and choice work together, it produces effect results. FitLyfe 360 lets you know if your programs are driving effectiveness. You’ll be able to see healthier employees, less healthcare spending and high productivity. Silo Approach – is complex with increased cost and administrative time. The wellness program manager administers each program separately. Difficult for users and wellness teams alike. 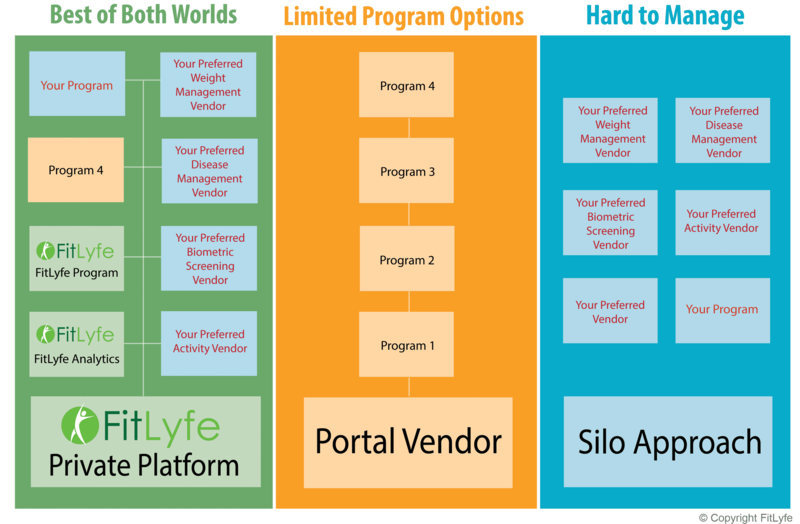 Portal Vendor – often gives a single connection to your wellness programs; but it’s expensive and often limits choice. It severely restricts control over program effectiveness and what’s relevant to your employee population. FitLyfe 360 Private Wellness Platform – gives you unlimited choice at a lesser cost. Program managers are in complete control along with a dedicated support team. FitLyfe 360 provides the insights you need for better outcomes.